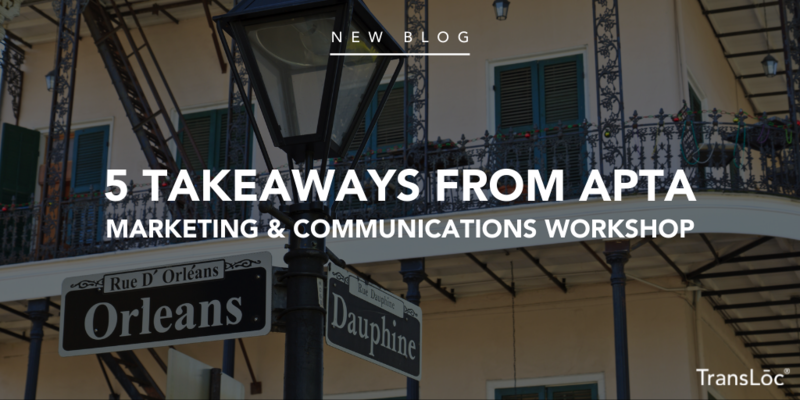 Recently, a few members from TransLoc’s marketing team hopped on a plane to head to New Orleans for the 2019 APTA Marketing & Communications Workshop. This intensive and interactive workshop, focused on public transportation marketing as a whole, has been teaching industry professionals for over 10 years. With a record-breaking attendance of nearly 370 at this year’s workshop, the opportunities to learn from transit marketing personnel were in abundance. Here is our quick list of takeaways gathered from sessions and conversations had in the Big Easy. Positive Thinking -- Yes, those cheesy Hallmark cards and stylized Pinterest quotes do make a difference in your overall productivity (and happiness) in the long run. At the same time, surrounding yourself with more positive people in your life will impact your own positivity. Flow to Goals -- Stop multitasking, it doesn’t work! Get yourself focused on the task at hand, and put away distractions, so you can flow towards your attainable goals. While you’re at it, consider incorporating a visual that illustrates how close you are to achieving your goal. Prioritize Relationships -- Do you have a best friend at work? Studies show that having a best friend at work encourages you to be more productive. Of course, you get double the imaginary brownie points if your best friend has a positive attitude. Gone are the days of putting all of your eggs in the traditional marketing basket. Transit agencies are leaning in heavily on digital marketing tactics to gain exposure and buy-in for their new and existing services. With a variety of free software at our fingertips, producing these digital experiences is easier (and more affordable) than ever. Is there a secret sauce to building a trustworthy brand amongst your riders while keeping the human element alive? The short answer is yes, but that sauce doesn’t come without attentiveness. Brands that build trust focus on knowing and building relationships with their customers. They then use these relationships to guide the design of great experiences that keep customers coming back for more. Once they’re hooked, ensuring that targeted, personalized content is flowing on a regular basis is a must. One session provided attendees with four different case studies that illustrated different approaches for agencies to connect with their residents, based on the needs and wants of each community. A common theme among all four case studies was GO TO THE COMMUNITY. In-person engagement was a major component of each initiative. Translating important information -- Translating key marketing materials can help your agency connect with non-English speaking residents. Utilize a census study to determine top languages (by percent of population) that should have printed materials available and then make additional translated materials, and languages, available in digital format. Honing in on a key message -- Target your message on what your residents care about the most: safety, timeliness, and service area. Whatever that key message may be for your residents, hone in on it and make it the ‘hero’ of your outreach, engagement, and marketing efforts. Giving marketing campaigns plenty of time -- This is especially important if your agency is looking to update or change a route. Give people plenty of notice that changes are happening, how the updates will benefit them, and what are some of the alternatives you’re providing in the meantime. Finding an engaging spokesperson -- This is a great way to connect with a sector of the community that will require more sensitive and careful attention to the messaging. Is there someone of that community that can help you engage residents better than your other outreach efforts? Or maybe it’s an active organization that can provide another platform for your message. APTA’s AdWheel Awards Luncheon was especially fun this year as we had SIX past and present microtransit partners recognized for their outstanding marketing efforts. We are honored to work alongside such talented teams on a daily basis! Did you attend the APTA Marketing & Communications Workshop? What were some of your key takeaways? Or what additional transit marketing and communications best practices or fun facts do you have to share with your team? Share your insights in the comments below.